Daniel Freedman (Undying Love) and Sina Grace (THE LI'L DEPRESSED BOY, NOT MY BAG) are at it again! 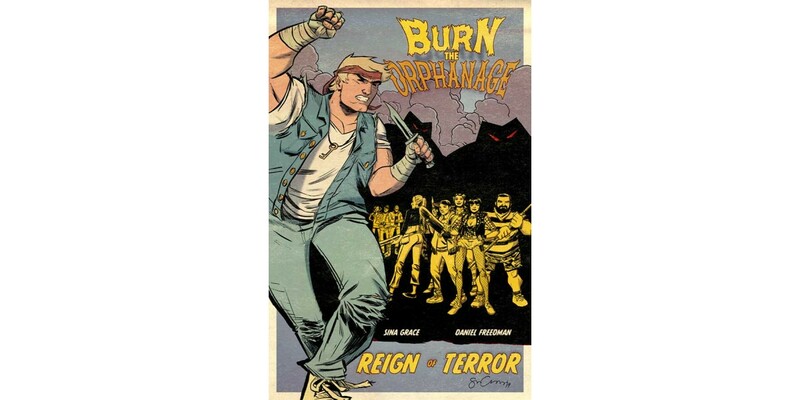 The original blow-up hit miniseries about revenge and action is now an all-new monthly Image Comics series called BURN THE ORPHANAGE: REIGN OF TERROR..
Rock finally returns home, only to find his city under siege. And you won’t believe who is the cause of all the chaos. REIGN OF TERROR moves readers into the the next phase of BURN THE ORPHANAGE. While Rock and his team of street fighters have gone on a lot of adventures together, they've never faced such overwhelming odds. “Friendships and allegiances will be tested as our heroes are put through a gauntlet of new and old foes, betrayal, and oversized robot mayhem,” said Freedman. "Reign of Terror is exciting because it's the first in a series of longer form story arcs we have ready to tell. BURN THE ORPHANAGE is only just getting started." Rock will be taking back his city in BURN THE ORPHANAGE: REIGN OF TERROR #1, which arrives in stores on on 5/7 and will be available for $3.50. It can be pre-ordered with Diamond Code MAR140488. Cover B by Andy Belanger can be pre-ordered using Diamond Code MAR140489.